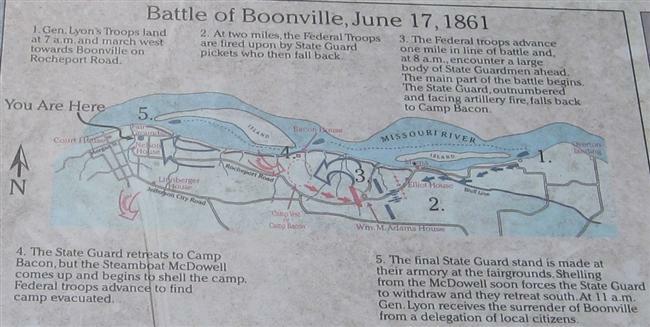 Directions: Now you will return to the Battle of Boonville Historical Marker [ Waypoint = N38 58.655 W92 44.027 ], which is located near where the final few minutes of fighting took place. From the previous tour stop (Camp Bacon), continue to drive west on Rocheport Road. After about 2.4 miles, turn right (north) onto Al Bersted Drive. After about 0.3 miles, turn left (west) onto E. Morgan Street. After about 0.4 miles, the historical marker will be ahead on the left.